The old Medina of Marrakech and the architecture and the authenticity of the Moroccan houses have been sources of inspiration for the owners when they decided to renovate the heritage and turn it into an authentic, private and a charming little Riad. Autochthonous materials have been used such as Tadelaqt, Bejmatt and Nhass. 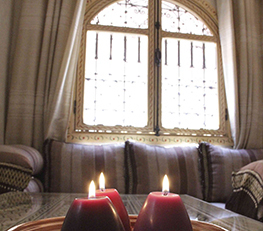 Throughout the Riad one can find the spirit of traditional Moroccan architecture. ‘Dar si Yanis’ is perfectly located in quarter Laksour, inside the old walls that surround the Medina of Marrakech. The Riad is just a few minutes walk from the famous Djemaa el Fna and the minaret of the Koutoubia Mosque, Marrakech most famous symbol. The lively souks are just around the corner and the most important monuments and cultural treasures of this imperial city are all within walking distance. Riad ‘Dar si Yanis’ provides a rare and privileged location to discover Marrakech.